In this this article it provides about how to make beautiful and attractive designs using Geometrical shapes in some simple easy steps. This article will help you kids in increasing there ability of using the Geometrical shapes. There are total 21 worksheets attached with this article and step by step process given. When your kids study in maths about the geometrical figures like square,circle,triangle and rectangle etc.This article will guide your children's in making a good use of geometrical shapes. This article will help your children's to use geometrical shapes in another way also and not only in maths. Here below are some step by step process given of making attractive designs using Triangle, Circle and Square. Step 1 - In this step you have to make an triangle as shown in picture. Step 2 - Here now you have to make one more triangle just a little smaller than what we made above and fit in it as shown in picture. Step 3 - Now as we know that there are three corners of triangle, so we will fit three more corners in the inner one triangle one by one as shown in picture. Step 4 as we done above fit another small triangle in the another corner of inner triangle as shown in picture. Step 5 - Now do same with the last remaining corner of inner triangle fit a small triangle as shown in picture. Step 6 To make this design more beautiful we will insert a small circle in the inner corner as shown in picture.Now your triangle design is ready, color it with beautiful colors to make it beautiful. 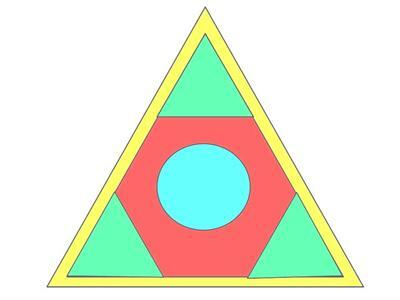 Step 7 - So your beautiful Triangle shape Design is ready with beautiful colors. Step 1 - Our first step is to make a big circle as shown in picture. Step 2 - Now you have to insert a big star shape in the circle of seven corners as shown in picture. 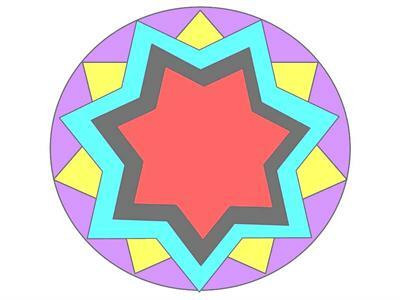 Step 3 - Now you have to make a same star on it just slight turn it as shown in picture. Step 4 - Now no need to turn what we made above make it similar but smaller than it as shown in picture. Step 5 - Once more you have to make a same star just a little smaller than it as shown in picture.Now your beautiful design in Circle shape is ready to color. Step 6 - So your Circle shape beautiful design is ready with beautiful colors. Step 1 - In this step you have to make one big square as shown in picture. 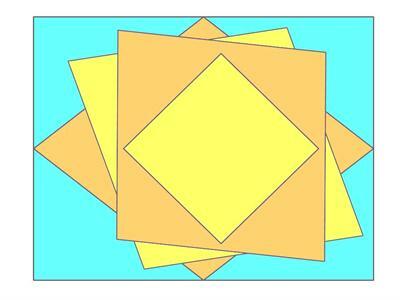 Step 2 - Now you have to make one more square shape but tilt in right side or make an diamond shape in it as shown in picture. Step 3 - Now you have make one more square shape slight tilted right side as shown in picture. Step 4 - You have to make one more square shape slight tilted in right side as shown in picture. Step 5 - Now here as we made a diamond shape in Step 2, make same here but small one in it as shown in picture. Now your beautiful design in square shape is ready to color. Step 6 - Your beautiful and cool design is ready with beautiful colors in square shape. So you can make these designs more beautiful by giving new look to it and make it attractive using some sparkle colors aslo.